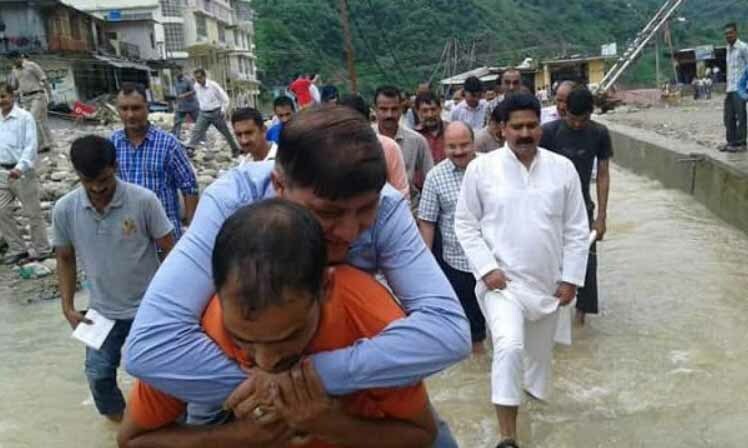 Shimla : Rajinder Rana, Vice Chairman of Himachal Pardesh Disaster Management Authority courted controversy on Wednesday as a local was allegedly seen carrying him piggyback during a visit to flood-hit areas of Mandi district.Rana, a former legislator, allegedly accepted a piggyback ride from a local to avoid getting his shoes wet when he visited flashflood-hit areas in Dharampur town, four days after the natural calamity, to review the situation. Three members of a family had died in the flash floods. Pictures of Rana, while being carried by a local through ankle-deep water, soon went viral on the social media.Rana had resigned in 2014 to contest the Lok Sabha elections on a Congress ticket against sitting BJP MP Anurag Thakur. BJP leader and former chief minister Prem Kumar Dhumal dubbed the incident as "unfortunate". "If top functionaries are like this, then you can very well imagine how others are functioning in the government," he told reporters in Shimla.